Do you need to know how to remove a tick from a dog? Follow the directions below and find out what to expect once you're finished. Ticks are small arthropods that look similar to spiders, and they feed on the blood of other animals in order to survive. Although the small amount of blood a single tick takes is fairly insignificant, an animal infested with numerous ticks is in danger of becoming anemic as well as ill from one of the numerous diseases these tiny creatures carry. 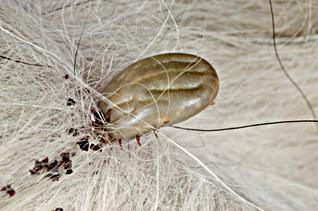 During it's lifetime, a tick attaches itself to one host after another. It feeds until it is full, and then detaches itself only to latch onto a new host when it is hungry again. In the process, the tick can pick up diseases from one host and transmit them to the next host, and this is truly what makes these creatures so dangerous to dogs, people and any other animals they prey upon. The longer the tick remains attached to its host, the more likely it is that the host will acquire a disease from the tick. So, quick removal is the surest way to prevent your dog from contracting a disease from the bite. The following directions can help you remove a tick from your pet, but be sure to follow them carefully for the best results. If you're at all squeamish about dealing with ticks or don't feel you can remove the creature yourself, don't hesitate to take your dog to your vet and let him handle the removal. For a home removal, you will need the following supplies. 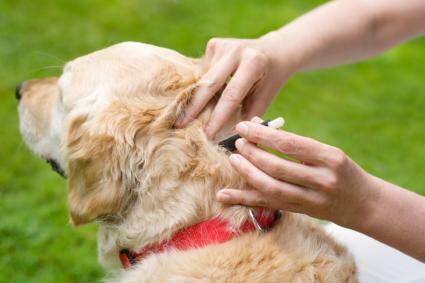 Persuade your dog to sit or lay in the most comfortable position that still gives you access to the tick. 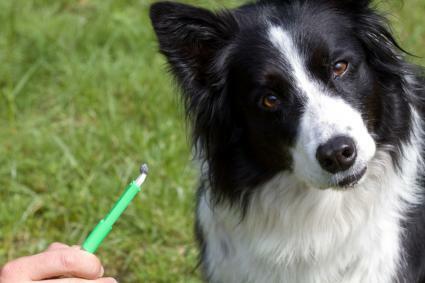 Provide your dog with something to chew on as a distraction, or ask a second person to pet your dog and help hold him in place while you work on the removal. Using your tweezers, carefully grasp as much of the tick's head as you can. This means you'll need to get very close to your dog's skin. Avoid putting any pressure on the tick's body because the fluids in it, including saliva and blood, contain harmful bacteria that you don't want to accidentally inject into your pet. Applying slow and steady pressure, pull the tick out in one straight motion. Avoid pulling the tick at an angle or twisting as you pull because this could separate the head from the body and leave it embedded in your dog's skin. If that happens, you'll need your vet's help to completely remove it. Once you have removed the tick, drop it in the glass of alcohol. This is the surest and safest way to kill it because you can't drown it in water, and you don't want to smash it and release the harmful fluids it contains.Once the tick is truly dead, you can pour it in your toilet and flush it down the drain. Alternatively, you may actually wish to save the tick in a sealed jar or plastic bag so your vet can identify exactly which type of tick it is. This can be very helpful in the event your dog becomes ill after the removal. Dipping your cotton ball in fresh alcohol, gently swab the wound from the tick to help disinfect it. Afterward, you can apply a small amount of antibiotic cream to the area to help stave off an infection. You should also clean your tweezers with alcohol before you put them away. Wash your hands to lessen your own risk of infection. It's not uncommon to see a small amount of swelling in the wound after the tick has been removed. Dogs frequently have a small reaction to the tick's saliva, but this usually goes away after about a week in most cases. If the swelling persists longer than this or worsens, you'll want to call your vet and bring it to his attention. The vet may decide it's worth bringing your dog in for an exam. Now you know how to remove a tick from a dog. Just remember to watch your dog for any signs of illness in the weeks after the removal and call your vet if you believe your dog might be growing ill. It's always better to err on the side of caution where ticks are concerned. Of course, using some method of tick control on your dog can prevent one of these parasites from ever attacking your pet.